1. Get as many CBUG disks as you can, as well copies of the resources listed at the bottom of this document. You will also need to track down a copy of SuperScript II so that you can read B Series word processing files. SuperScript II, the B Series Commodore User's Guide, and the Programmer's Reference can be purchased from vintagecomputer.net. Freeware utilities, IEEE drive manuals, and B series commercial software can also be purchased from this source. 2. You will need a PET to IEEE cable to connect peripherals (such as disk drives) to the B series. 3. To activate most commercial software; attach everything and with the program diskette in drive 0 hit the SHIFT+RUN/STOP keys. 4. Most software written for the B Series computers is ONLY compatible with the 8050 IEEE diskette drive. You can use other Commodore IEEE drives such as the 8250 and SFD-1001, but you will have to run a BASIC program to emulate "8050 mode" first, before your software will work. 5. You can't run C 64/128 software on a B. You can't run Plus/4 software either. You *can* run PET 8032 software using an 8032 emulator called 8432” that is found on CBUG #1. It works pretty well. TBUG has PET software if you can't find any here. 6. Not all Commodore monitors are compatible with the B's video signal. My favorite monitor for the B (assuming you don't have a high profile unit with built-in monitor) was made by US International, model VM1230. This monitor was distributed by Protecto Corp among others. A closed circuit TV is good. A Commodore 1701/1702/etc. will do in a pinch but the characters will not be as sharp. For example you'll have trouble differentiating between a single and double quote. 10. The B's use the same polyphonic SID chip as the C64! Unfortunately the command POKE's are different. You have to convert audio written for the C64 first before you can play it on a B. 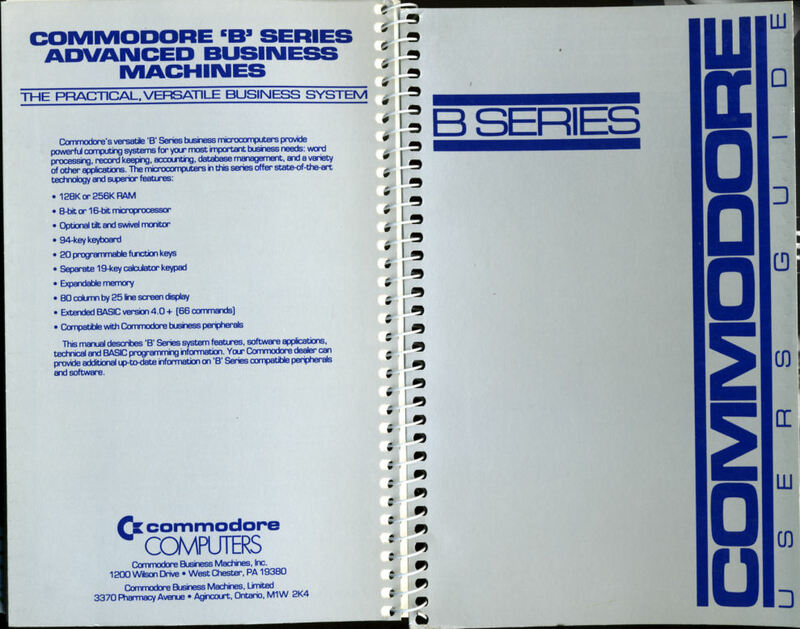 See The Commodore B 128 Programmer's Reference Guide for details. Given the extra horsepower of the B vs. a C64, there is the potential for even better audio! 11. Make sure your IEEE cables are grounded properly. If your screen display "rolls" while in operation, it could be due to an improperly grounded IEEE cable. Some 8050 drives will cause the monitor display to roll no matter what you do. Try keeping them separated. 12. Can't read or write to diskettes? a. Clean the single-sided drive head with a high-percentage isopropyl alcohol (90%+). c.	Before you use a disk you must format it. The command is: header "disknamehere", d0, i01 (assuming you have a disk in drive 0 of an 8050 drive). NOTE: i01 assigns the identification name/number; 01” can be substituted for any two alpha characters. d.	The command: ?ds$ will tell you if the processor board of the disk drive is OK or not. The response you want will be something like: "73, cbm dos v. 2.x"
e.	If your drive lights are blinking, use the user's guide to diagnose the blink pattern for hardware problems. f.	Carefully press tight and/or re-seat chips to strengthen IC connections to board. a.	BeeLine v.2.1 terminal software XMODEM. Try an AVATEX modem. b. Copy files from IBM format using CMD's WCOPY+ software, attach a IEEE/serial converter to a C-64/128 computer so that you can interface with an IEEE drive and voila! (sort of) It ain't easy! c.	I have never done this before, but you can use the FAST BUS system developed by CBUG members. See CBUG #84 for details. I have some parts for this system, but have not attempted as of this writing. 14. Before powering up a 8050 drive, remove all diskettes to avoid accidental destruction of data. This can happen! b.	CBUG #46 has a utility called copy-all b128.4” by Liz Deal that I like. 16. Most word processing for the B Series was done with SuperScript II. The file extension is SEQ. 17. Most database programming for the B Series is was done using SuperBase. The file extension for SuperBase files is also SEQ, so if you can't read a file in SuperScript, try SuperBase (or SuperOffice). 18. A B-128 can get pretty hot. If you place a fan to blow lightly on the computer you will prolong its life. Don't store diskettes on top of the B-128, or 8050 drive for that matter. The following was taken from Commodore service manuals and technical news letters, plus CBUG. Post date is last update, this record will be updated as new tips are located. The most useful thing here is the match between the blink codes and the location on the PCB/part that is faulty. ...this command will help the drive head find its way back on track. That and cleaning the drive head itself with isopropyl alcohol is often the solution to a lazy drive.